Normally the months of July and August is a fairly quiet time for the boxing fraternity, but not for the TRAD TKO Boxing Gym in Canning Town, where it has been one of the busiest summer breaks for a long, long time. Besides hosting the Russian Olympic Boxing squad, during their London 2012 campaign, the gym has been a hive of activity, as no less than twenty three of the boxers based there prepared for fights in September - including no less than three Southern Area title fights, an English title defense, a Commonwealth title defense and the big one, when TRAD TKO based Kevin Mitchell challenges Ricky Burns for his WBO World Lightweight crown. Somehow in the middle of this the TRAD TKO crew, headed up by Johnny Eames, still managed to put together, and compete in, the 3rd Annual Boxers & Celebrities Charity Football Tournament, in aid of the Indee Rose Trust. 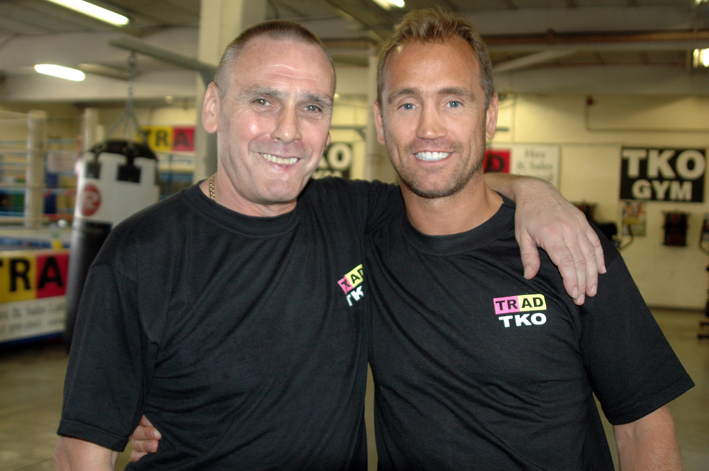 After yet another busy day in the office, TRAD TKO supremo Johnny Eames and star trainer Mark Tibbs took a little time out to talk about the upcoming schedule for their fighters, as well as those of TRAD TKO coaches Jimmy Tibbs, Bryan Lawrence, Alec Wilkey and Derek Grainger, at the famous fight factory. Johnny kicked off the proceedings, September is going to be a really busy time for all of us here at the TRAD TKO. It all kicks off at York Hall on Friday the 7th September when young Ian Bailey gets his first title fight, against Lewis Pettitt. It’s the first time in Ian’s career that he has had time to prepare, I’m not predicting a win because Lewis is a good fighter, but if I was a betting man I’d put money on Ian. Al (Lewis Pettitt’s trainer Alan Smith) offered me a bet, but I turned it down as I’d never bet on my fighters. Saying that I’m quietly confident that Ian will nick his first title and hopefully turn his career around out of the journeyman tag. It’s quite a busy show for the TRAD TKO Gym and for Mark Tibbs in particular, Mark’s got young Charlie Hoy and Tom Baker fighting on the show also. As Johnny finished speaking he turned to Mark, who firmly grasped the baton and said, Yeah it’ll be young Tom Baker’s third fight. He’s coming on real nice, he’s getting plenty of rounds under his belt sparring with Pete McDonagh, Gary Corcoran, Billy Joe Saunders and various other TRAD TKO fighters that Johnny, Alec (Wilkey) and Barry (Smith) train. On that bill I’ve also got Charlie Hoy, It’ll be his third pro fight also. He’s really planting down now and pushing through the shoulders so more explosive now. I expect them both, and Ian to really impress on the 7th and all come away with tidy wins. Finishing with a wink Mark then turned to Johnny, who then continued. The very next day, Saturday the 8th, we’ve got Danny Connor, he’s the British Masters Champion and he’ll be fighting for the Southern Area title against Chris Evangelou on the Matchroom Sport London Calling show at Alexandra Palace. Danny’s looking very good in training, he’s really turned his career around, he was a journeyman but he’s on a winning streak at the moment. His last one was a very good win and I just hope he keeps up the good performances. Also from the TRAD TKO we’ve got Erick “The Eagle” Ochieng defending his English title, against Ryan Toms, not an easy fight on paper, but Erick seems to make not easy fights on paper look easy so I’m sure he’ll keep on in winning mode. Yeah Buddy our Wadi “Machoman” Camacho is also on the show, fighting another unbeaten prospect Andy Ingram. Wadi’s full of confidence so am sure he’ll come away with another good win. the next week is even busier, first up on the 14th September we have Billy Joe Saunders topping the bill at York Hall, defending his Commonwealth title. Again Billy has been looking awesome in training, Jimmy and Mark (Tibbs) are doing a great job with him, which ensure us keeping another great Champion in the gym. On the same show from the TRAD TKO are young Frankie Buglioni, Gary Corcoran and Billy Morgan, these three are really starting to establish themselves as top talents. Also on the card Peter McDonagh will be fighting for an International title and finally Mo Hussein’s boy Ediz will be having his third outing. They’ve all been working hard in the gym so I expect we’ll have a good few wins there. Mark Tibbs, who had sat smiling like a Cheshire Cat whilst Johnny spoke then added. Yeah we’re back at York Hall again on the 14th. Dad’s got Billy Joe Saunders, who’s been fantastic in training, he’s gone to another level. He’s really focused and ready for more dangerous opponents that will come his way as he progresses towards the World scene. On that bill I’ve got myself Frank Buglioni, big punching Frank Buglioni. He really knows how to fight but he’s learning to use his jab a bit more as he’s going into longer fights now. Frank’ll be up against a really durable Polish guy. Young Billy Morgan now, you’ll be seeing a new Billy Morgan this season. I say a new Billy Morgan, I promise you even though he’s not the finished article, he has really developed over the summer. He’s going to be nice and fiery and you’re gonna see a lot of power from him and a lot of seriously slick boxing. I’ll also have Gary Corcoran in his fourth pro fight on this show. Yeah he’s coming on really well. I believe this will be his last four rounder as he’ll be moving up to six rounders. He spars them all, Kevin Mitchell, Pete McDonagh and the others here at the TRAD TKO at that weight. He’s seriously tough and even moves around with Billy Joe, even though Billy is much heavier. Gary had two great six round spars with Bradley Skeete, as Bradley was originally due to fight someone who was quite similar to Gary, but that fight got changed to Pete McDonagh so now Bradley has left the TRAD TKO to get sparring elsewhere. As I just said Pete McDonagh will be fighting Bradley Skeete, Peter works with us, he’s been around a long time so he well knows the game. All our fighters get a lot of help from Peter, he’s been helping us with some sparring with Kevin Mitchell so me and Dad have been prepping him with Tom Baker for the Bradley Skeete fight. I think it’ll be an entertaining fight, for the fans especially. We all work together here at the TRAD TKO, after all there’s no such thing as a self made millionaire, yeah you’ve got a millionaire but he’s had a team around him doing their bit and it’s the same in the fight game. Johnny nodded in agreement with Mark’s comments before continuing. On Saturday 15th were back at York Hall as we’ve got Eddie Corcoran fighting for the Southern Area title, against Kris Agyei Dua on the massive Goodwin show. Eddie’s a great fighter, he’s messed about on training for the past year or two but he’s back full time now and IÆm sure that Eddie will nick his first title and then onto better things throughout the season. On the same evening, I don’t know how I’m going to get to both of them but we’ve got Joel McIntyre and Tommy Watson boxing down in Portsmouth. These are two very good new comers and look forward to them impressing everyone. Johnny stopped momentarily and looked at Mark before continuing. The following week we’ve got the big one, when Kevin Mitchell goes to the SECC in Glasgow to challenge Ricky Burns for his World title. It’s the one we’ve all been waiting for, a big fight between two very good friends of mine. I’ve been friends with Kevin a lot longer than I have with Ricky so I’m going to have to lean towards Kevin. A hundred percent Kevin beats a hundred percent Ricky in my opinion, but it could go either way. Ricky, please don’t drop me out as a friend as it’s all about opinions in Boxing and you might prove me wrong, if you do, you do but I lean slightly towards Kevin on that one. A beaming Mark took over at this point. Yeah the big one on the 22nd, Kevin Mitchell - Ricky Burns up in Glasgow. You know what Kevin Mitchell is physically in tremendous shape but most importantly mentally he’s in the right place, he’s second to none. I’ve really got to give my Dad credit, I can’t give my Dad credit what I mean is my Dad is doing everything he can for Kevin, I’m doing my bit, the team at the TRAD TKO are doing their bit, everyone is doing their bit, Johnny’s doing his bit sorting out some sparring with his boys as well. It’s good, really good, everyone’s come together to get a World Champion in Kevin Mitchell. Yeah good stuff. This time it was Johnny’s turn to sit nodding and smiling as Mark spoke, before returning to the business in hand. Yeah it’s been a little while since we had a World Champion here, Kevin deserves it so we’re all behind him. Ok, after the trip to Glasgow we’re back in London at York Hall the very next day for the Miranda Carter show, Sunday Best, which is going to be a very busy one for us. We’ve got Menay Edwards, George Jupp, Brett O’Callaghan, Areti Mastrodouka, Scott Hartley and Erin Arif all fighting. So we’ve got six boys, sorry five boys and one girl, fighting on Miranda’s show, I wonder if we should have gone in partnership with her for the show. Miranda if you want to throw a few quid our way you’re more than welcome. The next week we’ve got Southern Area Champion Ben Murphy fighting a six rounder as he treads water waiting for a shot at the British title. It’s on a Micky Helliett show down in Brighton. We don’t know his opponent yet, but Ben’s Ben, even if he was fighting tomorrow he’d be ready. He’s been sparring regular at the TRAD TKO gym, looking good as always. In fact I had to give him two weeks off, which killed him. He’s back in the gym now and on September 29th he’ll be firing on all cylinders and hopefully we’ll get him the British title fight he deserves after that. On the same night we have Caine Brodie will be having his second fight in Peterborough under the Rob Waterman banner. We’ve just signed a promotional deal with Rob for Caine and Leon Williams, who knows we may even have Leon on that bill as well. I want to give big thanks to Rob for giving Leon a chance to get his career back on track, the kid deserves it and Rob was quick to come on board to help. So there you have it four fantastic weekends of action for the boys, and girl, from the TRAD TKO Gym in September. We’ve already got tickets for sale for most of the events at the gym, as well as on-line at our Box Office - www.tkoboxoffice.com - the others not yet on-line will be in the coming few days, so get your wallet out and come and support the TRAD TKO boys, and girl.